San Benito is a small city on the very edge of America, a few miles from the Gulf of Mexico and the same from the Rio Grande and the Mexican border. In 1946, it must have seemed heaven-sent to William Piper, assembling J-3 Cubs by the hundred at Lock Haven, Pennsylvania. And so it came about that San Benito's little airfield became a major assembly point for Cubs heading south of the border. 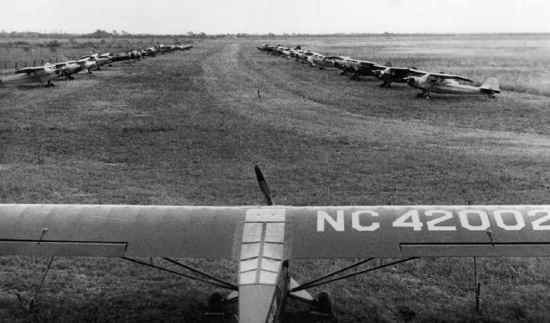 Go here for Paul Freeman's website about Texas's abandoned airfields, and for the story he has put together about San Benito's year or two as a major hub in the postwar avaiation boom. I'd dearly love to have more information about the Cruze brothers and the Cubs they assembled for delivery to Latin America--not just Mexico, it seems, but elsewhere in Central and perhaps even South America. In the meantime, a tip of the virtual hat to George Hobbs, who brought the enterprise to my attention; to Paul Freeman, who runs the Texas website; and to the late Steve Cruze, who supplied the photographs and much of the information on San Benito. The airport of course soldiered on, though it didn't quite make it into the 20th century. By the 1980s it had a single 3200-foot paved runway, but it was eventually closed, and in 2002 Steve Cruze stopped by to photograph the remains, including a windsock still on the abandoned hangar.